October is National Manufacturing Month. Manufacturing Month has been designed to expand knowledge about and improve general public perception of manufacturing careers and manufacturing’s value to the local, state and U.S. economy. The Durant Area Chamber of Commerce, Kiamichi Technology Center, Durant Industrial Authority, Southern Workforce Board, Choctaw Nation and other partners will be collaborating to celebrate our Manufacturing/Industrial companies with several events throughout the month of October including a Durant Job Fair on October 4. 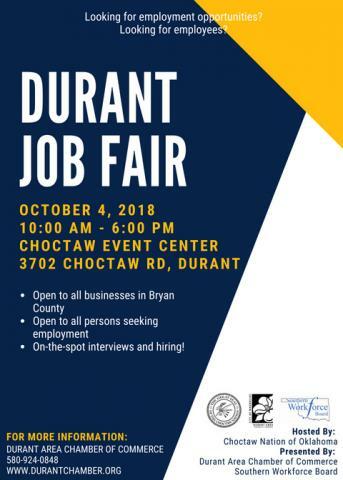 The Durant Job Fair will take place at the Choctaw Event Center from 10:00 a.m. to 6:00 p.m. and is open to all employers in the Bryan County area. Job-seekers are encouraged to come prepared for on-the-spot interviews and hiring. In celebration of the manufactures in our area, please check the Chamber calendar at https://durantchamber.org/events for posting of other activities and events for the month of October. For more information on the Durant Job Fair and other Manufacturing Month activities, contact the Durant Area Chamber of Commerce office at 580-924-0848.